1 Pair of Socks: $5.506-11 Pair: $5.25 ea.12 and up: $4.95 ea. TEAM COLOR TUBE SOCKS ... These Athletic Over the Calf Tube Socks are perfect for Any Sport - Available in 12 Team Colors. Red Lion Brand Patriot Sport Tube Socks feature a Full-Cushion Terry Foot and a Morpol Knit Leg for superior Cross-Stretch over Shin Pads. Athletic Sport Tube Sock Material: 88% Acrylic, 9% Nylon, 2% Polyester & 1% Spandex ... Tube-style construction. 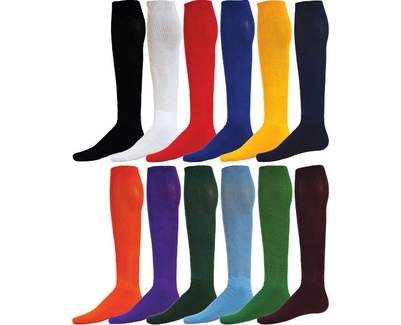 12 Sports Team Tube Sock Colors: (Left to Right, Top to Bottom - see photo above) � Black, � White, � Red, � Royal Blue, � Gold, � Navy Blue, � Orange, � Purple, � Dark Green, � Light Blue, � Kelly Green, � Maroon. NOTE: We've done our best to show the true color of these Team Color Socks, however since all monitor resolutions and brightness settings are different, these bright colors may look different on your computer screen. PLEASE call us if you have any questions about color-matching to uniforms, etc. Thank You. First it was very difficult to find this color in any of the sports stores anywhere in Los Angeles, so when I found these with Q-sport, I ordered them right away and they shipped them very fast. The quality of the material is also high in quality. I would definitely order again. Very good vendor. Nice thick socks that stay in place and are long enough. Going to be ordering more! Great Quality for the price! Fast Shipping! Good socks... Not to thin and look nice . Quick shipping and items are great! Bought these socks for my daughter and she loves them. Socks are the right size, right weight, right price, and perfect for the plus fours on the golf course.